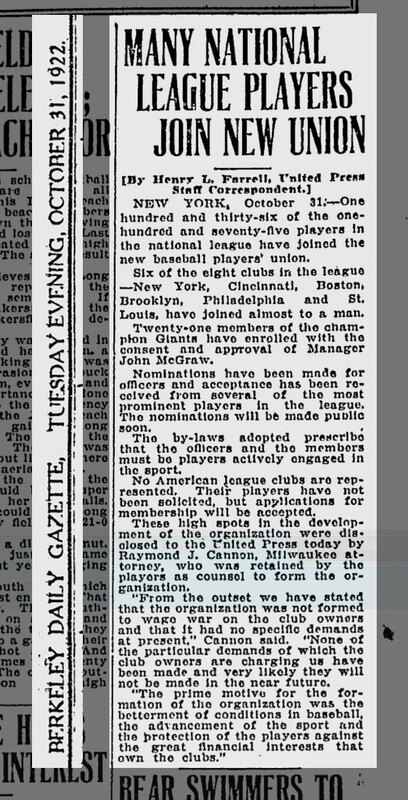 The Major League Baseball Players Association was formed in 1953, and for the first time ever baseball players had the same union representation that other workers had enjoyed for generations. 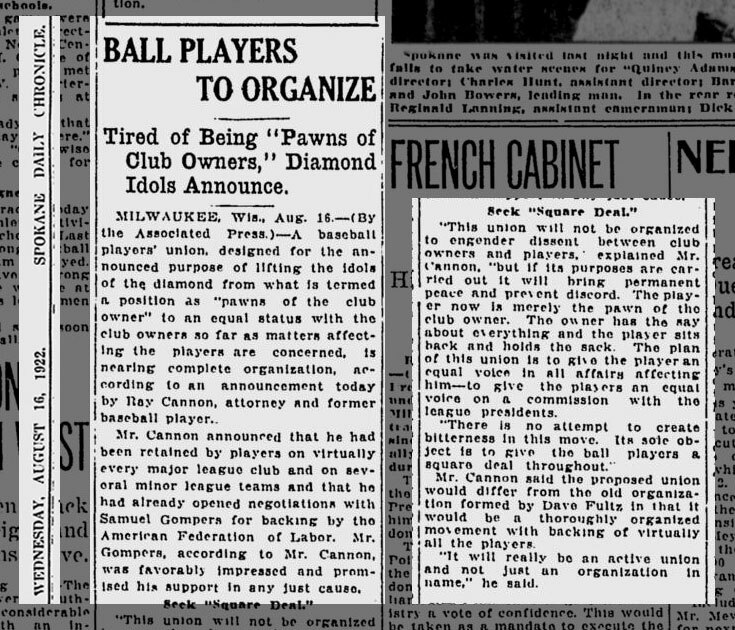 The MLBPA wasn't the first time ballplayers had tried to organize; there were several prior attempts at organizing, and one of those had a distinct Milwaukee connection. This story starts with Raymond Joseph Cannon, a Milwaukee attorney and former ballplayer. Born in Michigan's Upper Peninsula in 1891, he was orphaned at six months of age and grew up in an orphanage in Green Bay before coming to Milwaukee to attend Marquette Law School. Cannon had a strong legal mind, and was admitted to the Wisconsin bar before his 22nd birthday. He styled himself as a champion of the underdog and common man, often representing clients for little money—he kept his college job as a waiter for several years into his career. Cannon also had a lifelong love of baseball. He played in the Milwaukee City leagues, and spent a brief spell with the Toledo Mud Hens. In 1924, on a Spring Training tour with a minor league club, he pitched the Philadelphia Phillies to a 6-2 victory over the Boston Braves. In 1922, Cannon's vocations came together following the "Black Sox" World Series scandal. He was introduced to "Shoeless Joe" Jackson by Happy Felsch, who had come up through the Milwaukee Brewers system. After Jackson, Felsh and the others were kicked out of baseball by White Sox owner Charles Comiskey, Cannon represented Jackson in a breach-of-contract suit against the owner, looking to secure back pay due under his contract. Jackson and the other players had been acquitted by a Chicago grand jury for their part in throwing the Series (largely due to the fact that their signed confessions had disappeared after they had been presented to the grand jury but before they could be admitted into evidence in their trial), but Comiskey had fired them anyway under a no-cause termination in the contract. The champion of the underdog put Comiskey on the stand and asked him to defend the firings and the clause itself. Comiskey replied that Jackson had admitted to throwing the Series, and when Cannon replied to remind him of the acquittal Comiskey's attorneys produced the "missing" confessions. Even so, the jury returned a verdict in Jackson's favor, but the judge set it aside on the strength of the produced confessions. Cannon was able to secure an out-of-court settlement for his client. In was during this period that Cannon became convinced that players needed better representation. Surely they deserved the same rights to collectively bargain and to have union representation that protected workers in other industries. 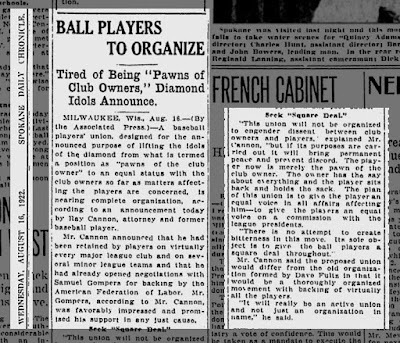 He took it upon himself to organize, and began recruiting current players for the National Baseball Players Association of the United States. In light of Cannon's involvement in the suit against Comiskey, I can only imagine what the baseball owners felt about his leadership of this new union. 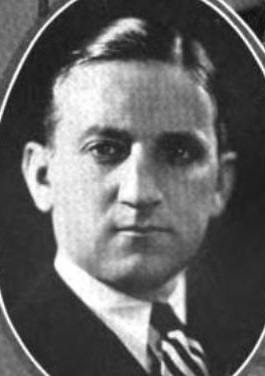 National League president John Heydler claimed that the existence of a Commissioner there was no need for a baseball union. "With Judge Landis at the head of organized baseball every player knows he can always get a square deal." Heydler granted that players may have had legitimate grievances against the owners in the past, but assured the nation that baseball's current rules were sufficient to fairly handle any possible situation. Cannon replied with assurances of his own, telling the owners he wasn't forming the union to address any specific current grievance but rather to handle what might arise in the future. 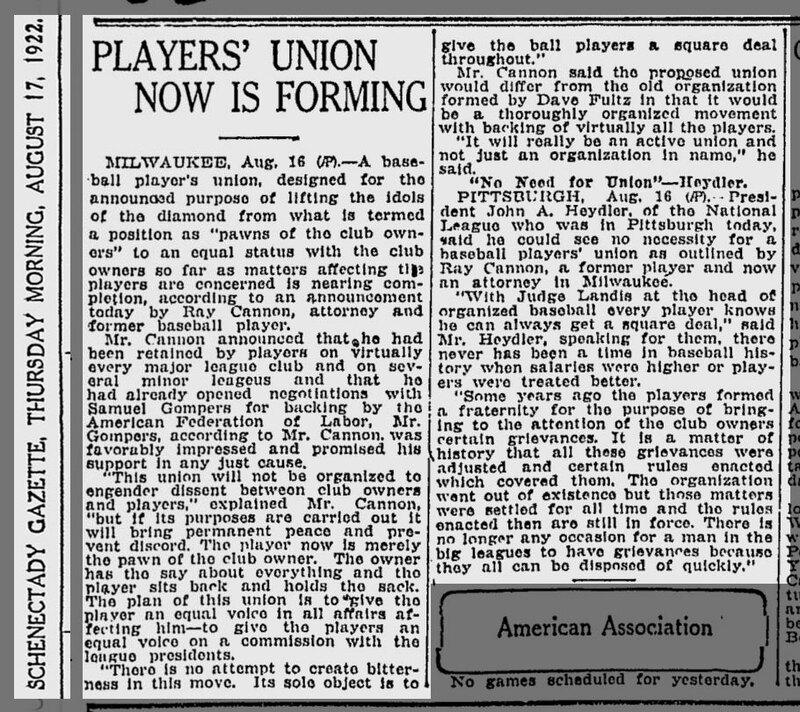 To the players, he maintained the union would be an active advocate, not a mere trade association. And from the players' perspective, his pitch seemed to be working. Cannon signed three-quarters of the active National League players, including virtually the entire rosters of the Cardinals, Dodgers, Phillies, Reds and Braves. One report indicated that twenty-one of the reigning world champions New York Giants had signed up. For their part, the owners claimed nonchalance. They had managed to prevent the new union from gaining much of a foothold in the American League, and were confident of their control over the players. A possible strike was floated, but that failed to impress the baseball magnates. 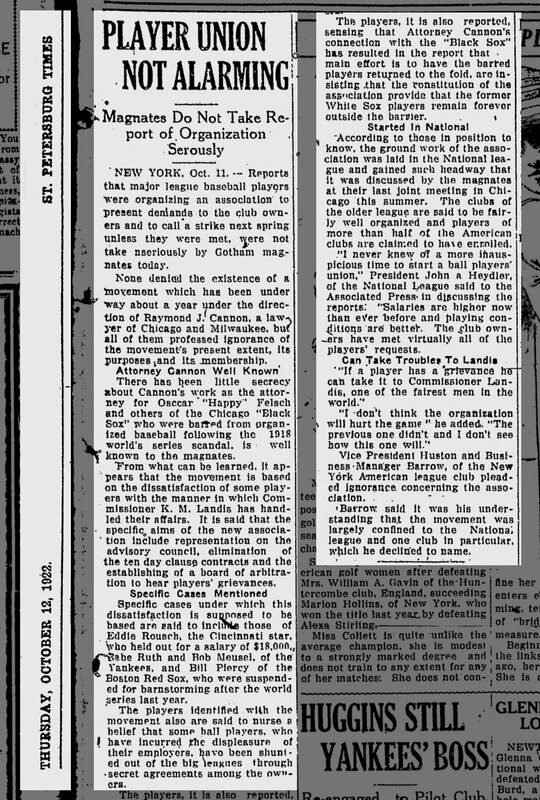 In the era of the Reserve Clause, which bound a player to one team for as long as that team desired, there was little a player could do but forfeit his ability to play at all. The owners' confidence was well-deserved. Players began to defect and the union collapsed. 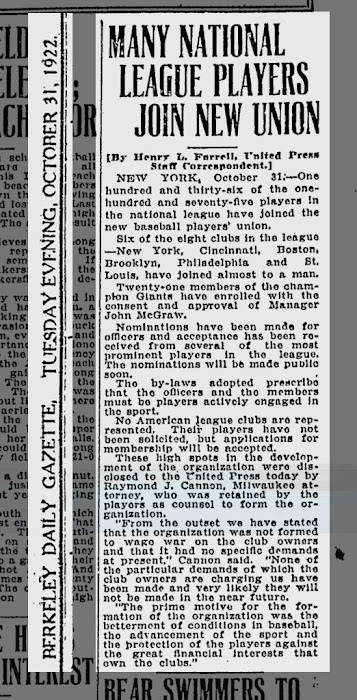 It would be another 30 years before the landscape changed enough for a real baseball union to take root. Following his defeat, Cannom was asked if personal animosity over the Comiskey suit might have poisoned his attempts to unionize; that is, if we has the wrong man to lead the charge. He declined to attach any personal feelings to the owners' resistance, rather that they were opposed to a union under any circumstances, and had the power to prevent players from joining. He further claimed that they had targeted influential players with bribes to kill the movement. "The union was not a success principally because the bitterly opposed club owners selected the most influential players on their rosters who belonged to the union and granted them every wish they desired, including a substantial salary raise, to forsake union activity." Cannon Brent back to his private practice, which kept him tremendously busy; throughout the 1920s he averaged more than 100 jury trials every year. There became to be some issue over precisely how he had landed quite so many clients, and in 1927, he was caught up in a sweeping proceeding by the Milwaukee Lawyers' Club before the Wisconsin State Supreme Court. Known as the "ambulance chasing quiz", it was intended to crack down on the manner in which attorneys were soliciting their clients. The complaint charged that "... such solicitations had been made upon the public highways, at the bedsides of injured persons who were writhing in the agonies of their injuries, that the solicitors impersonated public officers and exhibited stars and badges to overawe and unduly influence persons to sign such contracts." 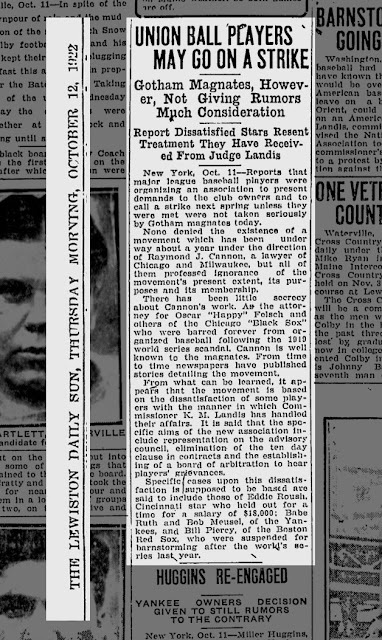 Sixteen attorneys were named in the complaint, and in 1929 three were convicted of soliciting clients in an unethical fashion and disbarred, including Raymond Cannon. The decision was was not unanimous, and one of the justices, Charles E. Crownhart, was concerned that the punishment was excessive. Crownhart was quoted as saying the stiff penalty could lead to "a weak and spineless bar in the future, one that will be afraid to fight the battles of the poor and the humble." Admitting that Cannon had made mistakes, Crownhard nevertheless thought he "seems to have a rugged honesty that has procured for a host of friends among the common people who have trusted him and still do." Perhaps because he could not practice law, Cannon sought public service. He ran for a Supreme Court seat, and even though he lost the election the disbarred lawyer carried Milwaukee County. Cannon continued to fight his disbarment, and in 1931 the Wisconsin State Legislature passed a special bill allowing him to resume his practice, a first in state history. The following year he upset an incumbent Congressman in a landslide to represent Wisconsin's 4th District in the House of Representatives, where he served for three terms. After returning to Wisconsin, he returned to his legal practice and made two unsuccessful runs for the Democratic nomination for governor. He was also personal counsel to boxer Jack Dempsey for many years. Cannon's son Robert C. Cannon followed in his father's path. He too graduated from Marquette University Law School, and immediately made a name for himself. At the age of twenty-seven, he ran for a spot on the Circuit Court in Milwaukee, beating an incumbent with nearly forty years of experience. That made him the youngest judge of a major court to be elected in the state of Wisconsin, and possibly in the entire country. He later recalled that the first couple he married was older than he was. 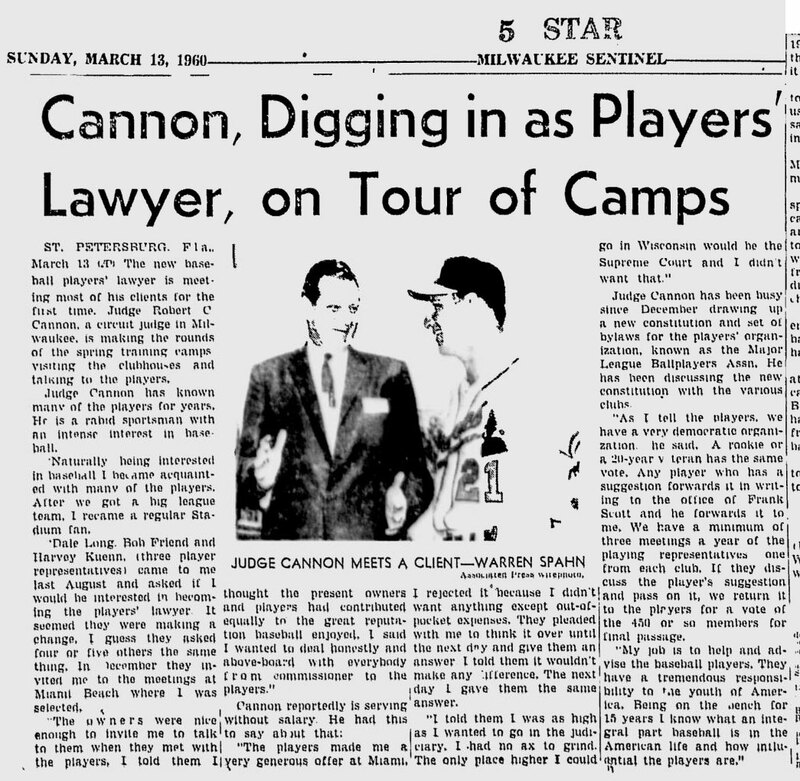 On December 4, 1959, thirty-seven years after his father tried to organize a baseball union, Robert Cannon became legal counsel for the MLBPA. He served in that capacity until 1966, when the fledgling union was restructuring and many of his office's duties redistributed. The players asked him to take over the new Executive Director position, but this would have meant a move to New York, and so Judge Cannon declined. Their next choice, Marvin Miller, presided over a revolution in labor relations. When baseball Commissioner William Eckert resigned in 1968, Cannon was briefly considered to take his place. 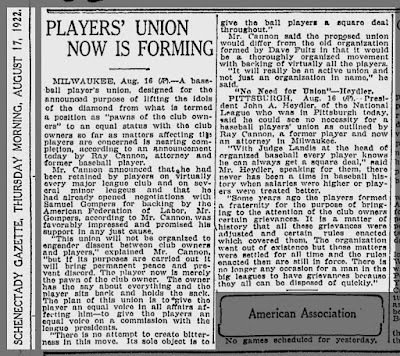 And there you have it; Milwaukee's connection to baseball's labor movement. 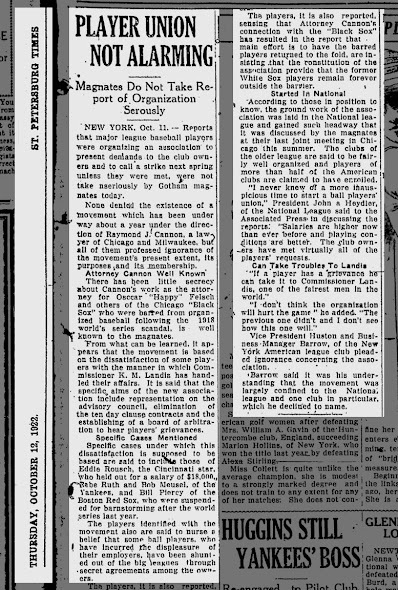 How different would the sport have been had Raymond Cannon been successful back in 1922, and what it would have added to Milwaukee's contributions to the sport. Milwaukee was the birthplace of the American League, and the home of the Commissioner's office during the tenure of Bud Selig, the second longest-serving commissioner behind Kennesaw Mountain Landis (and that only by a matter of months). Being the cradle of the union would have been another amazing feather in the city's baseball cap.